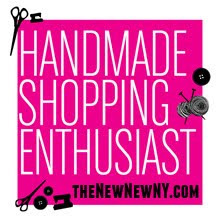 Here's a great way to compliment all your etsy gifts and in a pinch this can serve as a last minute gift too. This binding is simple, elegant and adds a unique touch to the everyday card or book. You can use single sheets of paper, so you can use smaller pieces of paper, even scraps. You can use as many pages as you’d like, for a little book, or a few, like I’m doing now, to make a card. This ones for my pops. + thread, linen thread is best but floss will work well too. 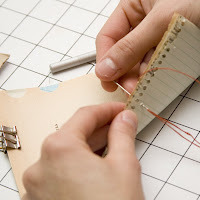 Cotton/sewing thread can be used too, but be careful not to pull too tight or you can rip your paper. Prep: Gather your supplies and papers to bind. Cut pages to the size you want and embellish as you’d like. 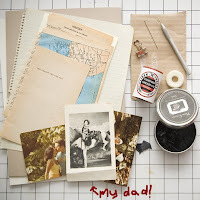 I’m using scraps of vintage lined paper, so I can write a note, and photographs with photo corners. Think about having a combo of lined, blank and decorative pages. Keep in mind that the binding will fall on the left hand side, the spine, so leave 3/8 inch for this. It’s better to do whatever writing/decorating before binding. 1.Order your pages and with a binder clip secure them together to keep them from wiggling around. Score or draw a faint line 3/8 inch from the spine to mark the line you’ll stitch. <--3. Knot the end of the thread and you’re ready to bind. Remember to pull the thread taunt but not too tight, because you can rip the paper. (You can follow these steps and images here or use this detailed diagram, at right and click to enlarge. This might sound complicated, but really it's so, so easy. Just try it!) In hole 3 insert the needle in between the center pages and come out through the top of the book. 5. Pull the needle down through hole 2, from the top to the bottom of the book. Again loop around the spine and pull the needle through hole 2 once more. Needle and thread will be at the back of the book. 7. Now pass down through hole 2, from the top to the bottom of the book, up through hole three, and down through hole 4. You are basically stitching down the book filling in the gaps. 8. At hole 4 make a loop around the spine, bringing the needle up form the bottom of the book and then down through the top. 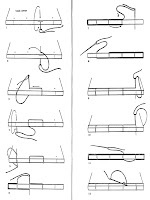 Loop around the bottom of the book, needle passing from bottom to top. <---9. Last step… You’re ready to complete the binding by returning to the original sewing station, hole 2. Instead of pulling the needle and thread all the way through hole 2 pierce the hole from the back of the book towards the top, but only go to the center of the book—just like when you started. Meet the begining thread and tie a knot to finish. 10. Did! Done! You’re great…. Make it happen! If you have time I hope you’ll try this . I know you’ll love what you make and so will those who you share it with! While it would be great, not everyone has the time to devote to making so check out warpeDesign, waisze and JournalisticTendency for great cards and books. Thanks and I hope you enjoyed this! Neat tutorial. I may do this for my mother's birthday. I've made two little books in the past using freebie postcards that you get in restaurants as the covers. That's so neat. I like how you have a map in your tutorial book.. 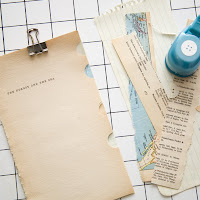 It makes me want to start making little books for any future trips I take! oh that is so cute - great tutorial. PS - I have a picture of my dad almost exactly like yours!! Great tutorial! I've been wanting to try book binding and this will certainly get me started. I think I actually have all the materials I need just sitting around here... Why haven't I started yet? I'm headed to Cambodia tomorrow and I always like to have a notebook with me. so I think I'll make a notebook with a small Cambodia map as the cover! ps- found you through Whip Up and I'm totally subscribing to your feed. it´s a easy howto to start binding books. Thanks! you're right-I did a variation of the imaged guide. I thought you could follow either. They are almost identical. Hope you have a great time in Cambodia! Wow! And thanks for all the great feedback everyone! I've got a ton of thread (I'm a quilter), but I don't know where to get linen thread! Could you give me a couple of sources? Thanks! Great tutorial, thanks! I just made some out of some scrap pages but I'm looking forward to making some more arty books in the future! How does it look like when it's finished?